Bathroom Remodeling in Sarasota, Venice | Sarasota Bathroom Renovations | Huskey Properties Inc.
Bathroom remodels may include room additions to provide larger bathroom spaces. Today’s master bathrooms and closet spaces are often as large as the master bedroom itself. One thing to keep in mind is not to be constrained by the present location of the bathroom plumbing. 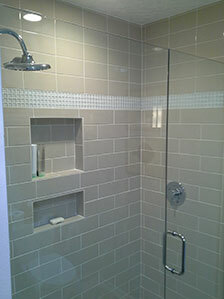 The walls and plumbing can be relocated to accommodate a new bathroom layout. Updated bathrooms contribute to the added value of your home, and today’s bathroom fixtures conserve water usage without giving up performance. Great inspiration and ideas can be found at www.houzz.com or BHG.com. Huskey Construction Inc. is a State Certified building contractor that specializes in residential remodeling, room additions, kitchen and bathroom renovations, whole house renovations and custom home building.